When you start traveling there's no coming back. So, since there was some jealousy in the air for my last trip to Budapest - it was way too easy to convince my hubby to overcome his fear of flying and plan a trip abroad. The destination was already set. We always talked about visiting Rome someday. So we arranged everything, my mother-in-law offered to babysit the kids and we were ready to visit the "Eternal City". Rome is one of the largest cities in Europe and the world's biggest historic center. In fact, Rome is the city with the highest concentration of historical and architectural monuments in the world. 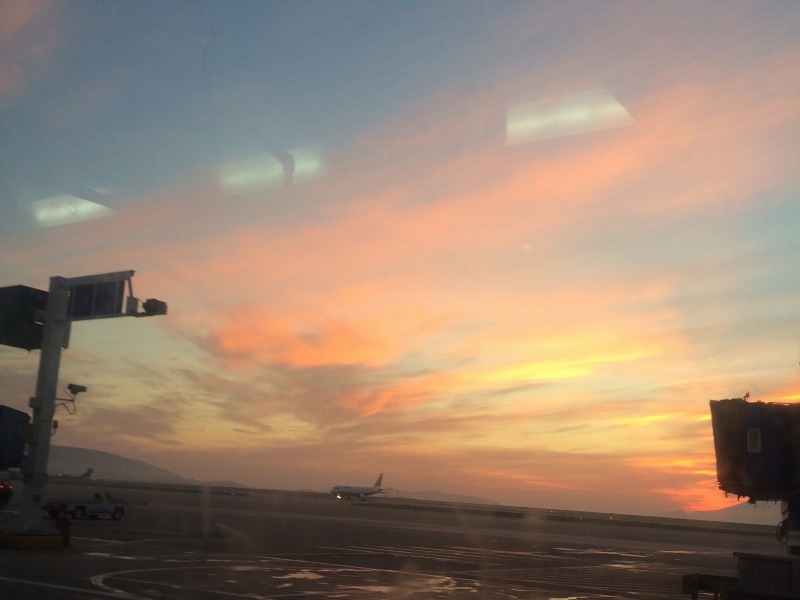 One of the benefits of the early morning flight was this amazing sunrise over Athens. A good sign for our trip! We arrived at Ciampino Airport (we traveled with Ryan Air) and quickly headed to the exit to catch the Terravision bus for the city. I had booked online our tickets to skip the lines. After almost 1 hour - due to morning traffic - we arrived at Termini Central Station. We took the Metro and headed for the Spanish Steps, since our hotel was located there (smart choice as we went only 1 week after the Paris terror attacks and that area is one of the most secured in Rome). Exiting the station we were on Piazza di Spagna and we saw Barcaccia - Bernini's famous fountain. On the top was Trinita dei Monti and the famous Spanish Steps but they were closed due to renovations and we didn't had the chance to sit on the steps (on my list for our next visit). 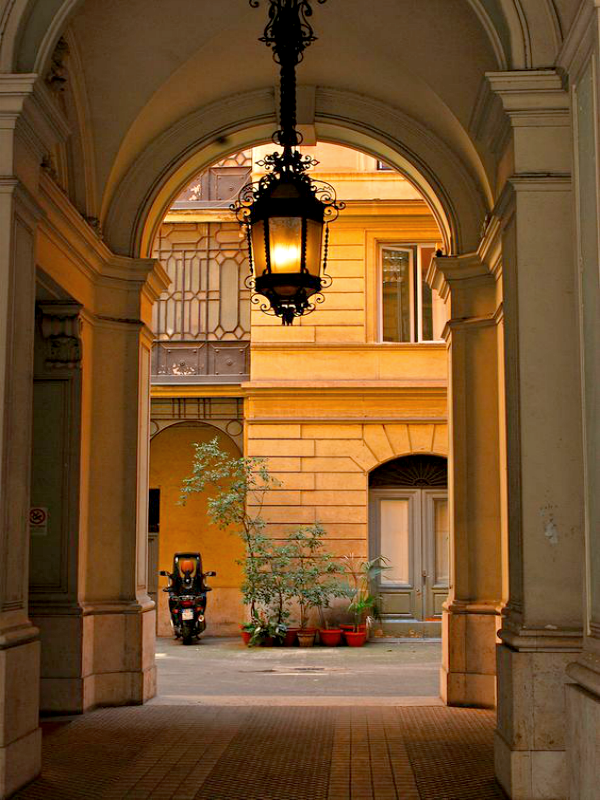 We walked towards Via Margutta, also known as the artists' street. Via Margutta is a lovely, quite alley full of green and wine trees. Back in the old times, mostly people who worked for the Mansions of Via del Babuino were living in this street but later it began to host artists, mainly painters and scapulars. We had chosen to stay at Hotel Forte, a lovely 3-star boutique hotel, located at the 1st floor of the historic building of Palazzo Alibert. 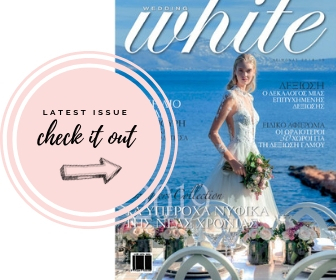 It offers beautiful, elegant rooms and the stuff is very friendly and helpful. During our stay there, we felt welcomed and cozy. 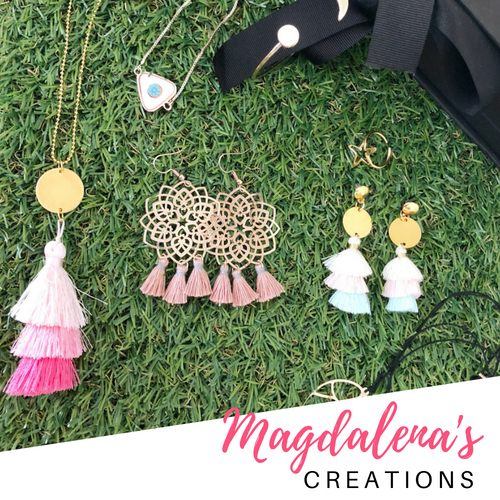 Their breakfast buffet is definitely their highlight as there is a wide variety of sweet and savory snacks, fresh juices, dairy products and serve amazing cappuccino! 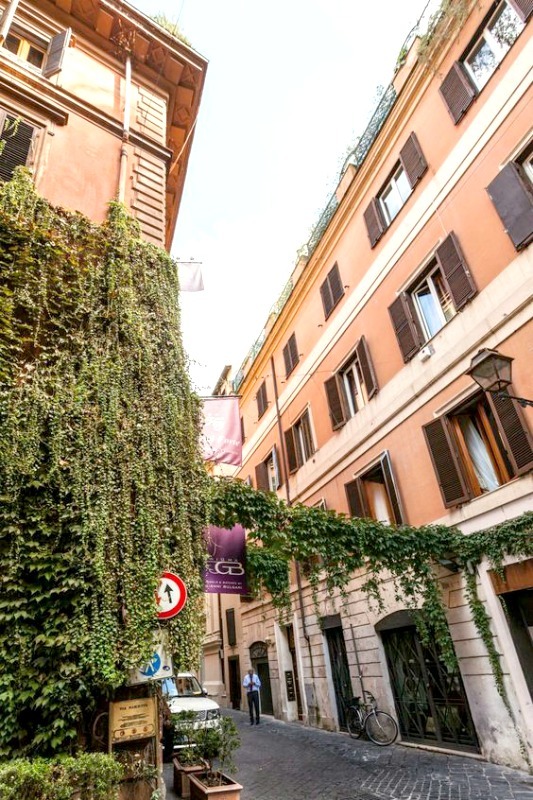 If you are looking for an elegant yet affordable (and family friendly) hotel in Rome close to the historic center, I highly recommend it. If we go back to Rome, we will definitely stay there. We arrived early at the hotel and our room wasn't ready but the receptionist kindly offered to keep our luggages at their storage and gave us a map to start exploring Rome. We walked up Via del Babuino and ended at Piazza del Popolo where we saw the twin churches, Santa Maria in Montesanto and Santa Maria dei Miracoli. At the opposite side of the square we saw Santa Maria del Popolo, that houses magnificent art pieces of Bramante, Raphael, Caravaggio, Bernini, Caracci and many more. 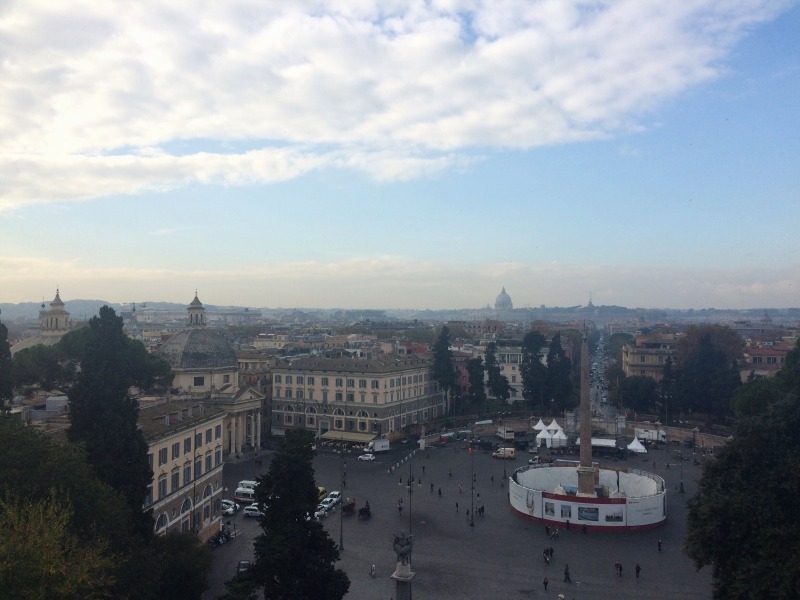 We walked up the hill and we found ourselves at the Pincio, a popular spot of Villa Borghese, where we took a glimpse of this amazing city. Since our day had started too early, we decided to walk down the "Tridente" to grab something to eat. Regarding snacking in Rome, one thing is for sure. Not only you are not going to starve but it's hard not to find something delicious to eat. Keep in mind that there is a different charge between sitting in a table and being served and eating at the bar. Most of the times, you pay over 2-3 times. So if you want to eating a snack head for the bar and save your money for dinner. 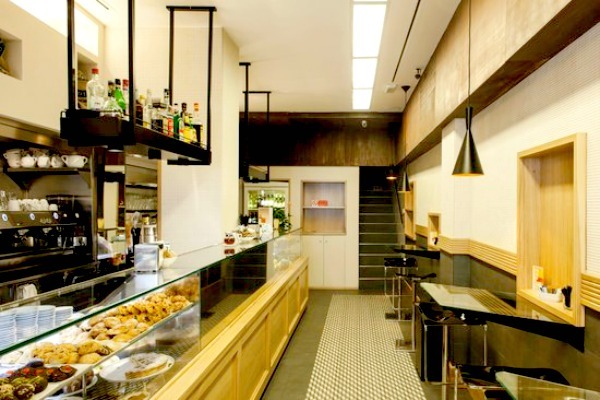 We've choose do-Bar, a cozy Cafe-Restaurant with a wide variety of sandwiches. We sat inside in one of the booth tables and we grab some panini. It isn't anything fancy but if you are in the area and you are looking for a quick and cheap snack, I recommend it. We went back to our hotel to change clothes (the weather was warmer than we expected) and headed for the historic center. 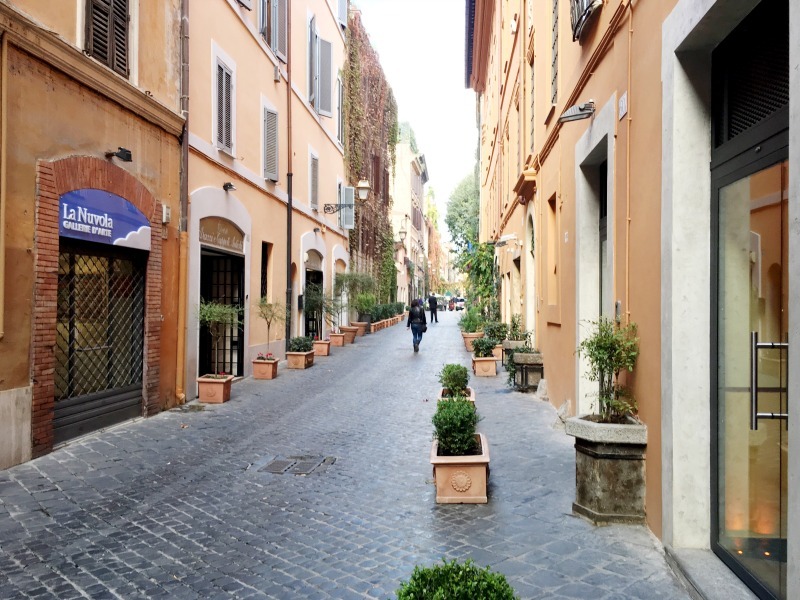 You've probably have heard it before but the best way to explore Rome is ... to get lost. 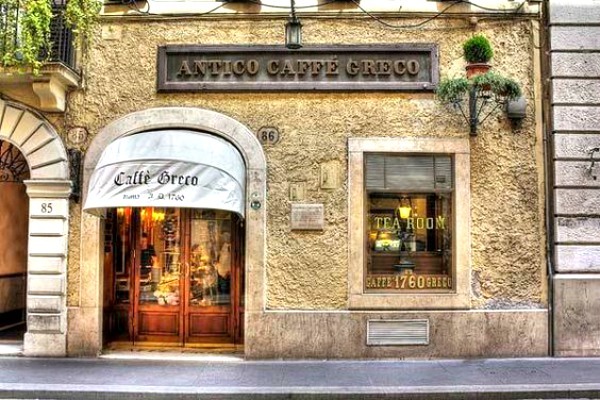 One of the first sights we "discovered" was the famous Caffe Greco in Via Condotti, the second oldest coffee shop in Italy, which was established in 1760. The interior is still the same as it was in the 19th century. 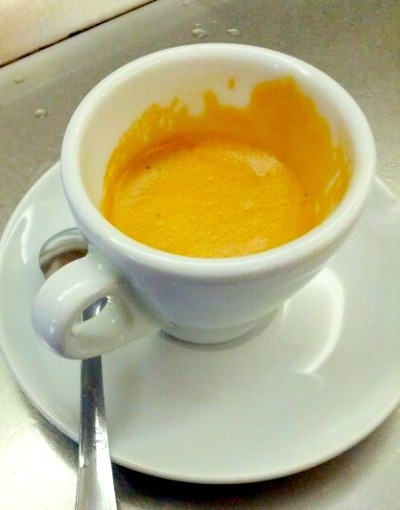 Did you know that espresso was invented there in 1806? 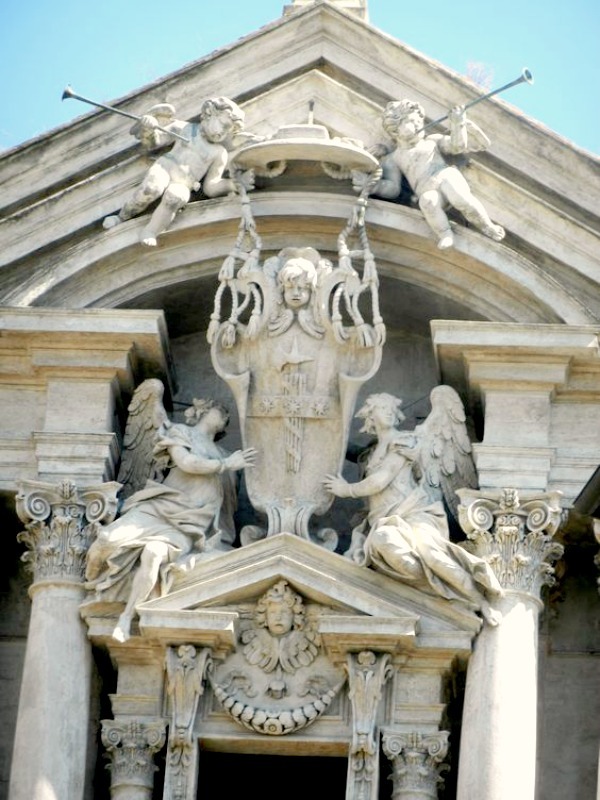 On the road for Fontana di Trevi, we passed by a lovely baroque church Santi Vincenzo e Anastasio a Trevi - later we've learned that there, in a secret opening were kept all the inside organs of the dead popes. We found Fontana di Trevi due to the noise. It was so crowded that it was impossible to take a picture without other tourists. What you see when you enter this small square is breath taking. Words can not describe how beautiful and unique this fountain is. That's why it took 122 years to be completed. We followed the tradition and throw a coin over the left shoulder so as to come back to Rome. 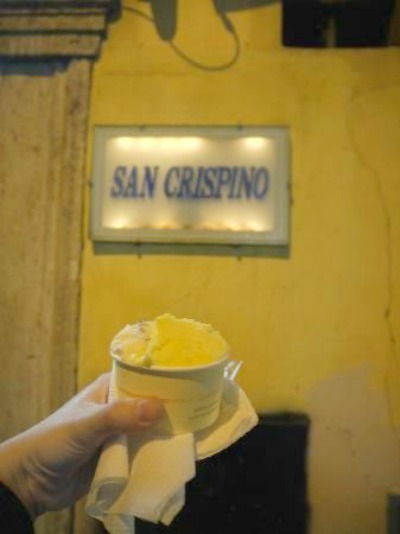 Near Fontana di Trevi we spotted Il gelato di San Crispino gelateria and we had to stop for gelato. We ordered hazelnut and honey gelato and both were delicious! 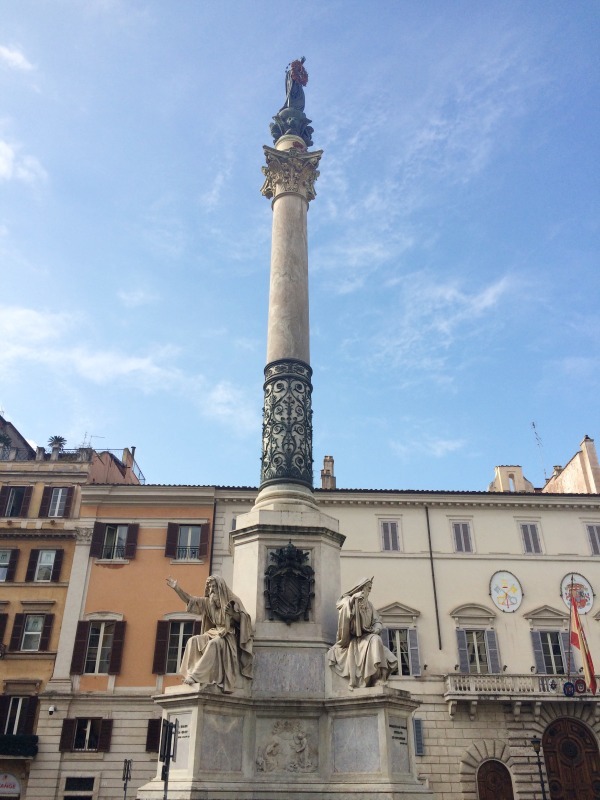 Piazza Collona, the square with the famous column in honor of Marcus Aurelius. 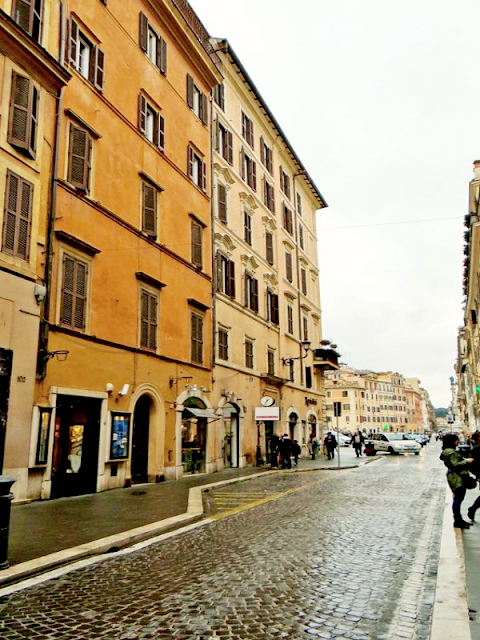 This square has many beautiful buildings, close by there is Palazzo Montecitorio, the former palace of Rome, which is now the headquarters of the Italian Lower House (apparently all the former palaces are turned into parliament buildings!). 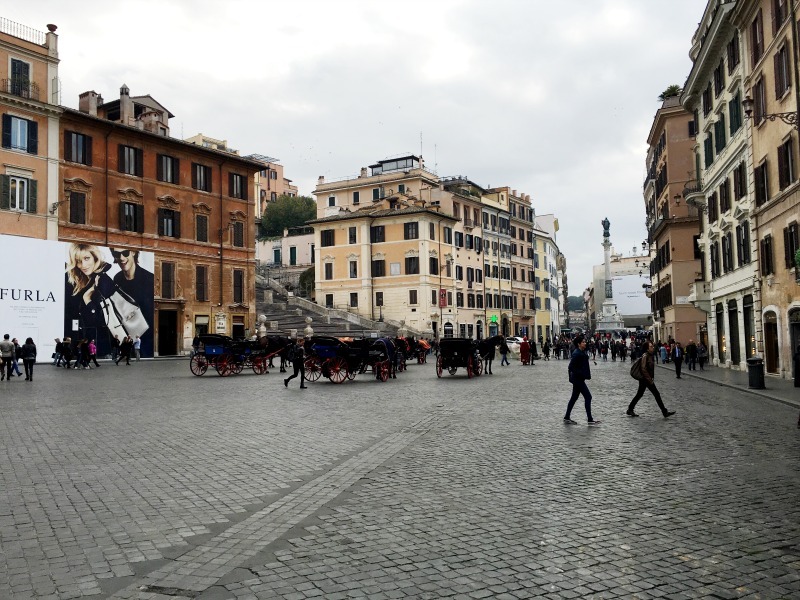 Piazza di Pietra, is a square named not only after the great amount of marble findings that are spread all over the square but mostly after the 11 columns that are found there. These columns along with a part of the lintel are the only remainings of Emperor's Handrian temple. 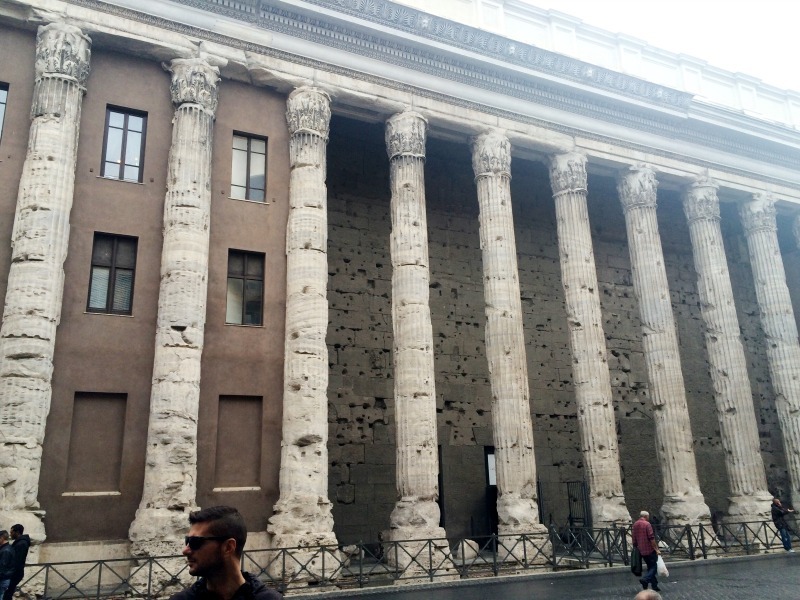 Basically, these columns survived because they were "part" of another building. 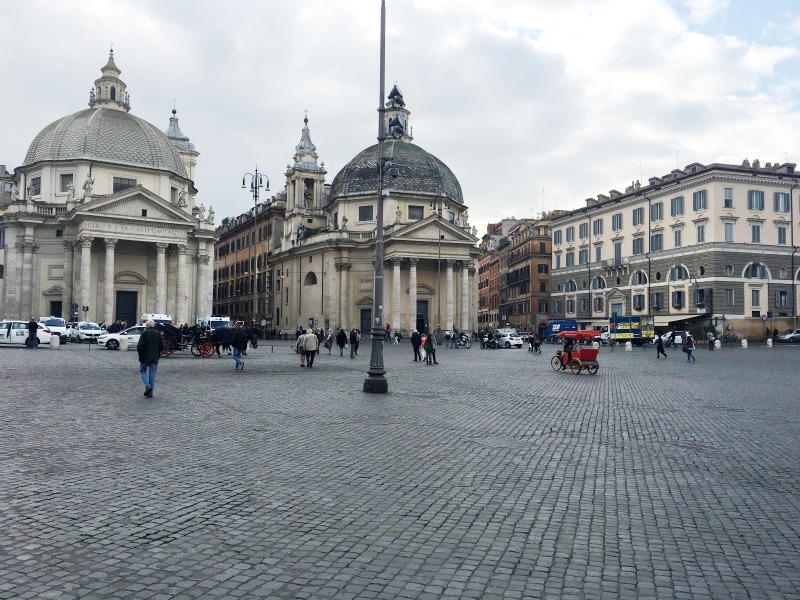 Piazza della Rotonda, one of the most beautiful squares in Rome. 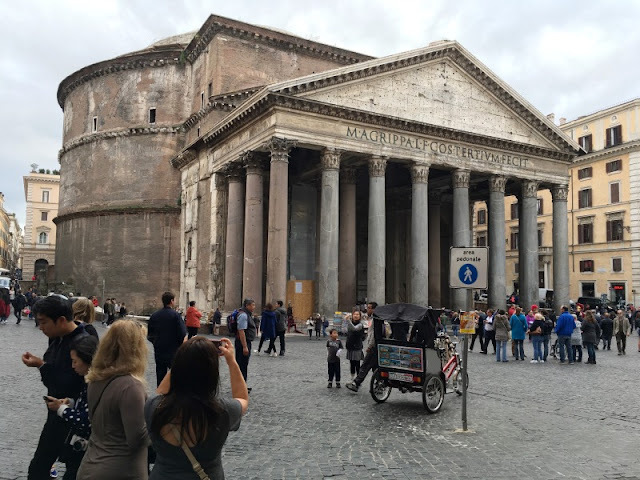 You walk down a narrow street and suddenly you have in front of you a beautiful Renaissance fountain and the one and only Pantheon, build in 27 b.c. 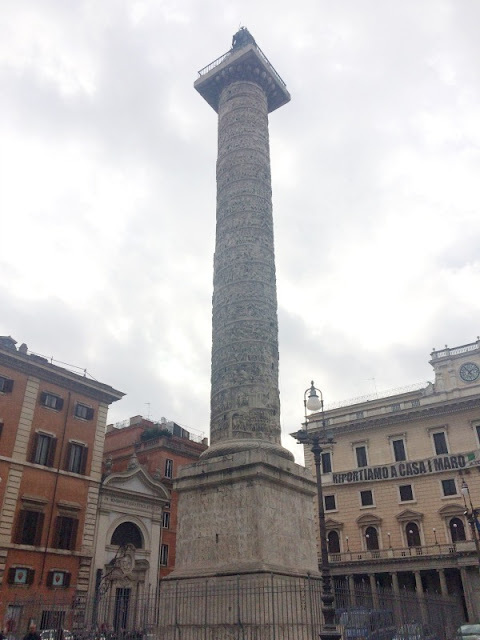 the best well preserved monument of Ancient Rome. 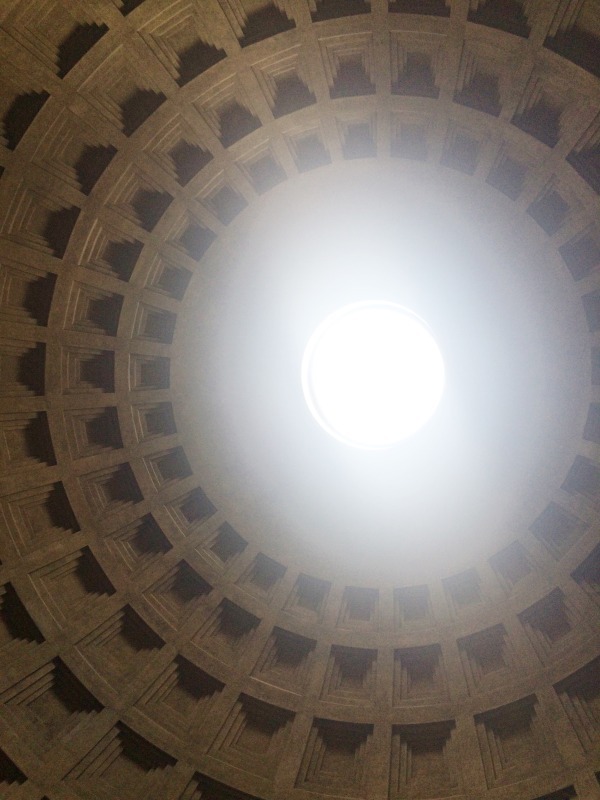 Pantheon with it's giant "eye" on the roof that lets the sunlight and rain drops come in. I would say that this monument made the biggest impression to me. Inside Pantheon are the graves of Raffael and Vittorio Emanuelle II (Italy's first king). Up until now Pantheon services as a Christian church and although there are always many tourists inside the atmosphere is very devouting so we sat inside for a while to get some rest and admir this masterpiece. Having rest for a while inside Pantheon, we walked to near by Piazza di Sant' Eustachio where Caffe Sant' Eustachio is located. I'd read that they serve the best coffee in Rome. 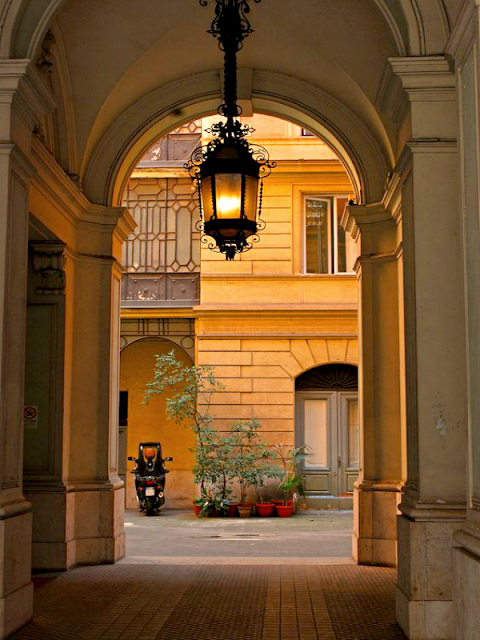 Being established in the 30's, makes it one of the oldest coffee shops ins Rome. Being a coffee-addict I had to try their coffee. It was the best espresso I had ever drink. Perfect flavor and smell! Espresso is served with a kind of "cream" on top. We also got a Nutela Millefeulle, which was delicious. 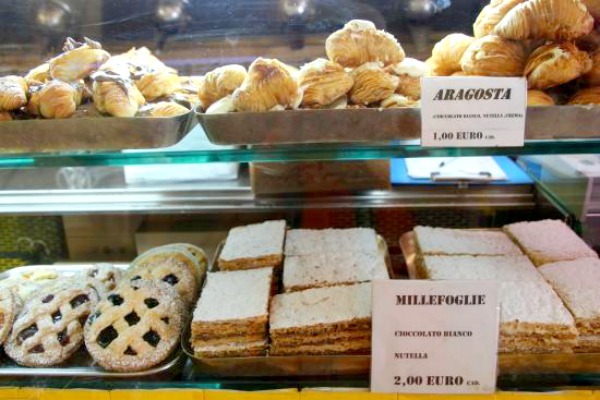 We went there a couple more times during our stay in Rome, but this pastry wasn't available. If you been there for coffee, you have to try it. 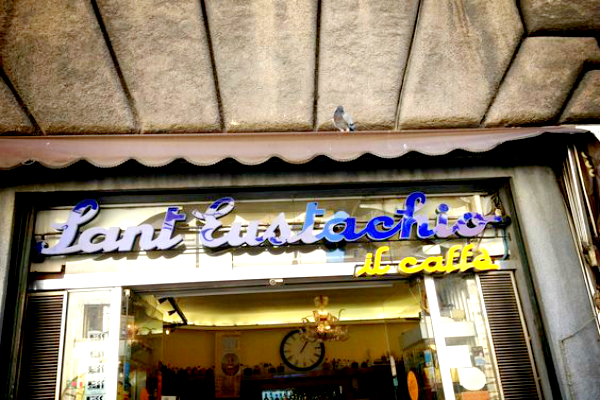 Caffe Sant' Eustachio is always crowded so I had to drink my coffee in a hurry by the bar. We bought some espresso capsules for our coffee machine back home, but the coffee wasn't the same as the one we had there. I think I've mention my problem with orientation. 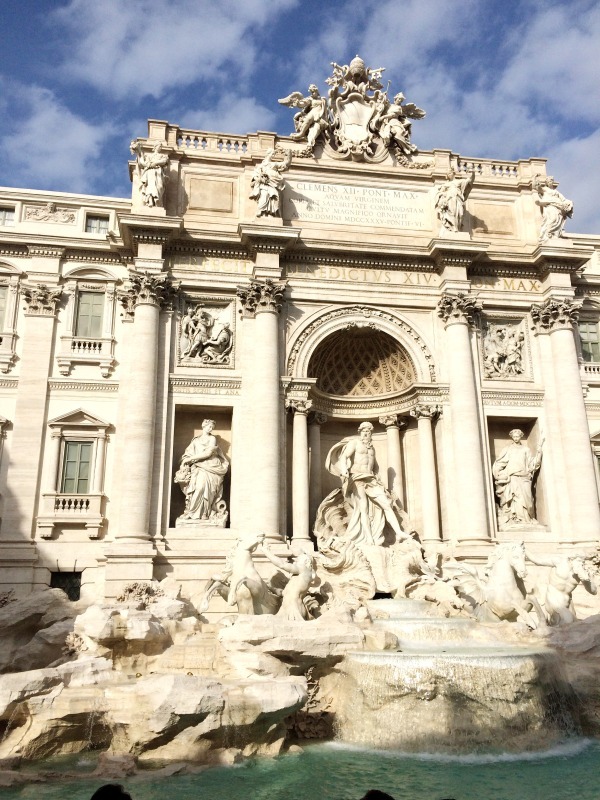 We were 3 days in Rome and it was impossible to locate Piazza Navona even using a map. On the other hand Elias was able to locate everything even without the map! 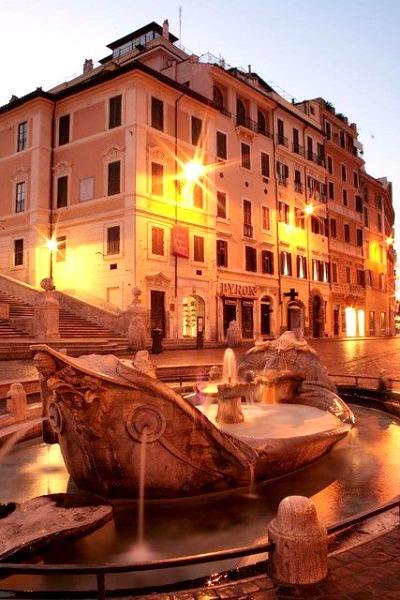 Piazza Navona is one of the most famous squares in Rome and propably the most beautiful one. It has the shape of a stadium as in Acient Rome times, in its place was located the Stadium of Domitian. The main centerpiece of the square is Bernini's Four River Fountain but Palacco Pamphili and Sant' Agnese in Agone church, are impressive too. As the sun was already set, water and lights offered a magical atmosphere and it was impossible to leave. 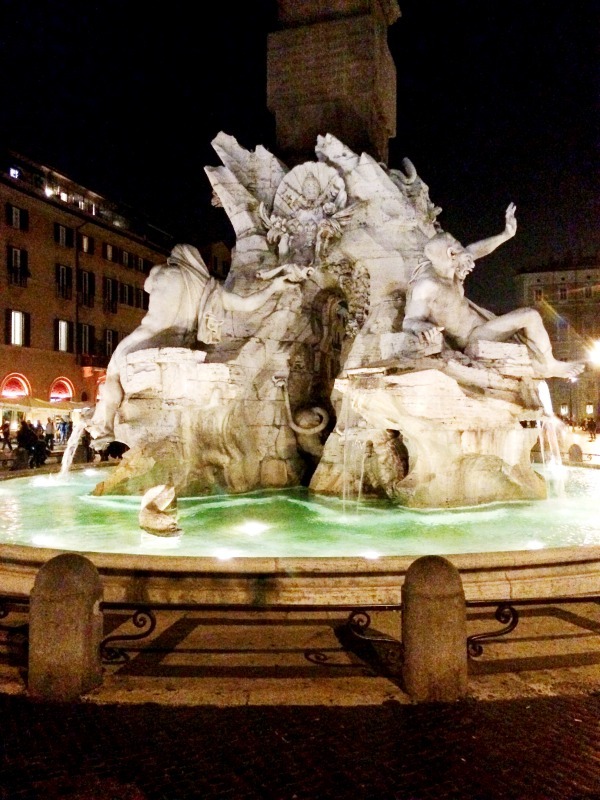 After admiring beautiful Piazza Navona it was time for dinner so we headed towards one of the near by streets. A friend had suggested Cantina e Cucina. A beautiful and cozy restaurant but too small. Tables are so close to each other. 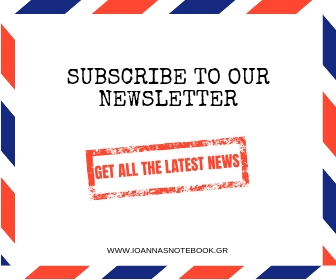 The stuff is very helpful and friendly and even some of them spoke us in Greek! Service was very quick and the food was delicious. Menu is short with a variety of salads, pasta, pizza and some meat dishes. We had a green salad called Vivaldi with mozzarella and grilled zucchini, pasta Carbonara (the authentic one, with the egg) and pasta Amatriciana. Everything was very delicious (especially the Carbonara) and the prices were OK. It is said that this place serves delicious pizza but we didn't manage to try it (on my list for next time). This place is very popular and there is a long waiting list during high times but it moves rather quickly. We had dinner there around 8:00 and we were able to find a table without waiting at all. After dinner, we walked around. Among one of best thing about Rome is that at the afternoon, some streets are closed to traffic and walking around is amazing. At the hotel we found out that this walking is called "passegiata" and its based on the Italian "dolce far niente" - the beauty of not doing a thing. 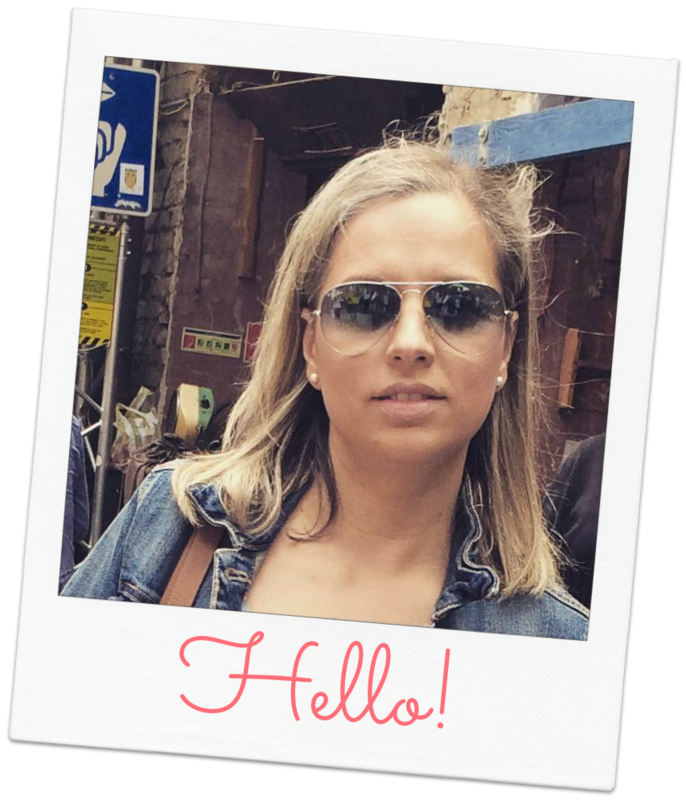 Rome is such a beautiful and interesting city that was impossible for me to write about it in one single post. It would have been rather long, so I "cut" it into 3 parts.